My hubby likes to eat salad every day. So I am search of salad recipes a lot. This spoon salad recipe is from Soframiz book. Normally when I get a book for review, hubby will flip the book and give it back to me to select the recipe. However in this book he told me to make this Spoon salad as it looks really nice. He said “why don’t you try it for this our evening salad”. Since he asked me I decided to make this Turkish spoon salad. 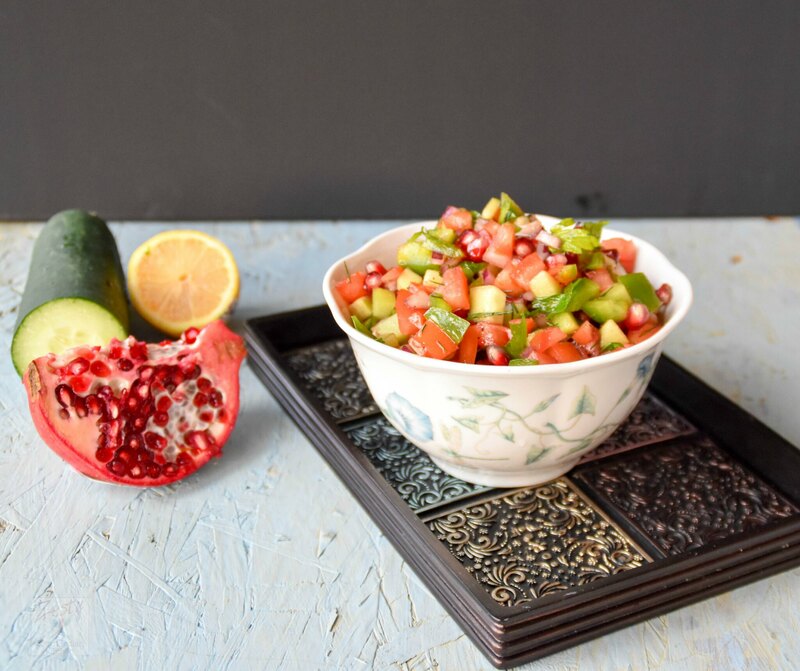 This recipe is from Soframiz: Vibrant Middle Eastern Recipes from Sofra Bakery and Cafe by Ana Sortun and Maura Kilpatrick. I like Middle Eastern cuisine and used to taste delicious dishes from my neighborhood Phoenicia store near my old house. Still I miss the delicacies, so decided to look for the recipes in this book. This is one book from which I have tried 4-5 recipes before writing a review on the book. Persian carrot and black eyed pea salad, Spoon salad, Tomato pomegranate walnut salad and za’atar bread is a few I have tried. Book start with 4 pages of introduction, then recipes include breakfast, meze, flatbreads, savory pies, cookies and confections, specialty pastries, cakes and desserts, and beverages. There are 18 breakfast dishes including a Turkish (or Israeli) breakfast, with traditional breakfast spreads include many small bowls and plates of olives, tahini, stuffed flatbreads, egg dishes, vegetables and cheeses taking up the entire table. Other recipes include, Shakshuka (baked eggs with spicy tomato sauce), rolled omelet with za’atar and labne, flower pogaca rolls, date orange brioche tart, olive oil granola, asure ( grain pudding) pistachio toaster pastries with rosewater glaze, Raspberry-rose petal turnovers and morning buns with orange blossom glaze. The second chapter is about meze which includes 21 recipes and include whipped cheese spreads and hummus to hearty and healthy bean-based salads (Persian carrot and black-eyed peas, Egyptian-style pea salad with walnuts, barley and chickpea salad, yellow split peas with za’atar spiced almonds. Spoon salad, and Tomato, walnut and pomegranate salad I tried and liked it. The third chapter is about flat breads, which include 11 recipes; I tried Za’atar bread from it. I found that there is no weight in grams only in volume. I think it would be great if they provided the measurements in gram. I found that temperature mentioned for baking Za’atar bread is slightly off, it says you need 20 to 30 minutes, but in my oven it required only 8-10 minutes in my oven. Next I would like to try summer vegetable lamejun. The fourth chapter is about Savory pies that include 9 recipes, I would like to try cheese borek with nigella seeds and stuffed simit are few. 5th chapter is about cookies and confections, 12 recipes, my hand is itching to make Syrian short bread cookies, Tahini short bread cookies,Date espresso Ma’amoul ,Sesame cashew bars and sesame caramel cashews. Chapter 6 is about specialty pastries, cakes and desserts, with 15 treats, including two types of baklava, milk pie, kunefe, Revani , Sofra’a gingerbread and pistachio bird nests are few. I have pistachio bird nests using shredded phllyo earlier not with whole phyllo sheets. It is in my do lsit. Then next chapter is about beverages, which include 3 types of tea, one lemonade and tahini hot chocolate. Final chapter is about pantry with pickled hakureei turnips, Persian spice, shawarma spices, pumpkin jam and rose petal jam, Moroccan spiced almonds and Za’atar spiced almonds. Beautiful photography and clear, large font make this a pleasure to read and cook I loved the recipes I tried, but need to careful with temperature, gram etc. I like “Soframiz” is one of my top cookbook which I am going to try more recipes from it. If you like Middle Eastern cuisine and love to try it at home then buy this book. 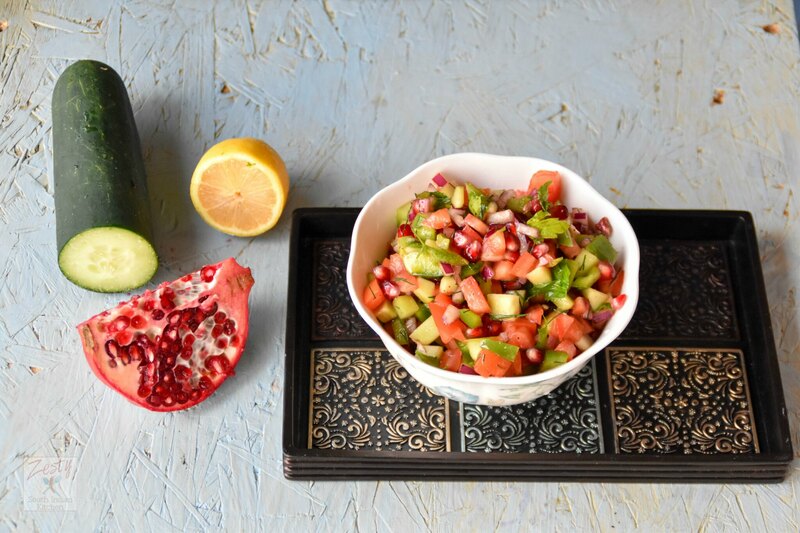 I tried Turkish spoon salad recipe which simple yet healthy salad you can have it any time of the day. Here comes the recipe. 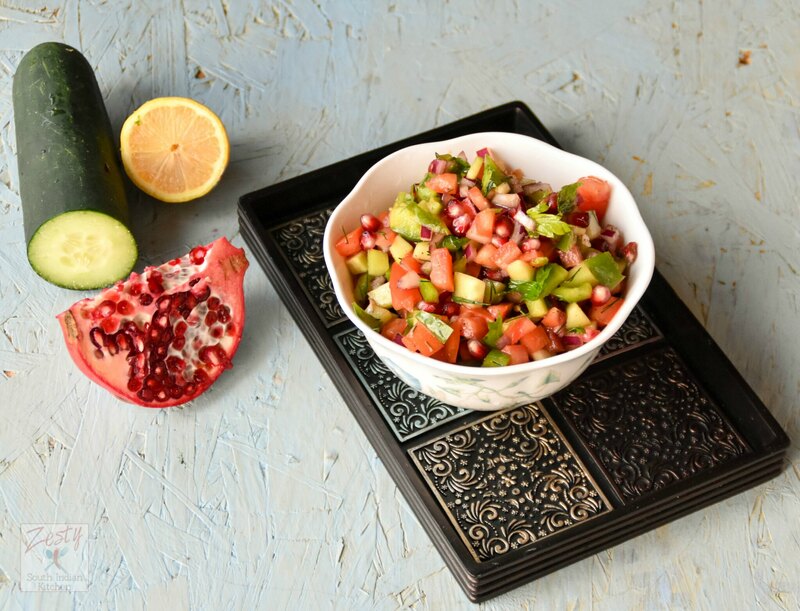 Delicious Turkish Spoon Salad great alternative for your salad recipe. Place the tomatoes in colander bowl under to capture juice. Add ¼ teaspoon salt and stir well and let the water drain from the tomatoes for 10 minutes. cucumber, green bell pepper, olive oil, lemon juice, pomegranate molasses, pomegranate seeds, parsley, mint, dill and chili flakes. Serve at room temperature or chilled romaine leaves as a bowl. 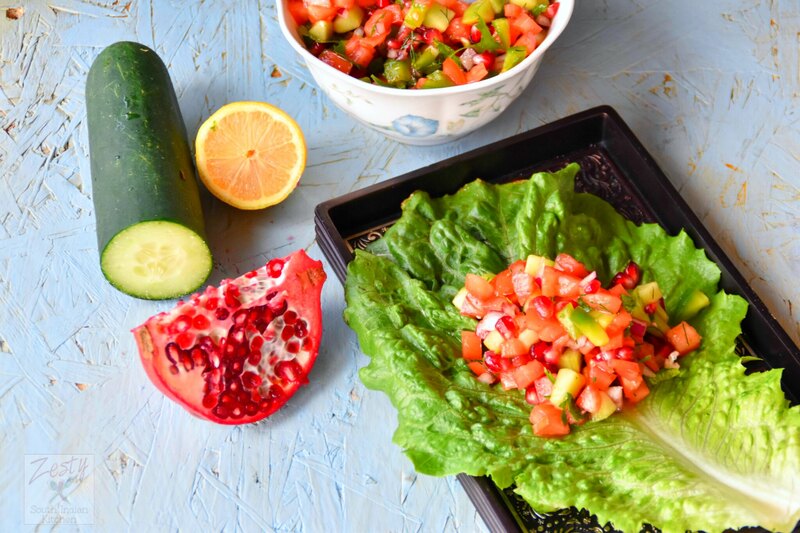 This salad is best eaten the day it is made but can be covered and stored overnight in the refrigerator. Wow, your hubby is very clever!. Love pomegranate. I eat it everyday, so that, your salad is perfect for me. I wish that I would eat more foods like this deliciously health recipe! Very nice. Thanks. Sounds like a really interesting cookbook – I love middle eastern food, so I should check it out! This sounds like such a fresh and delicious salad, thanks for the recipe! 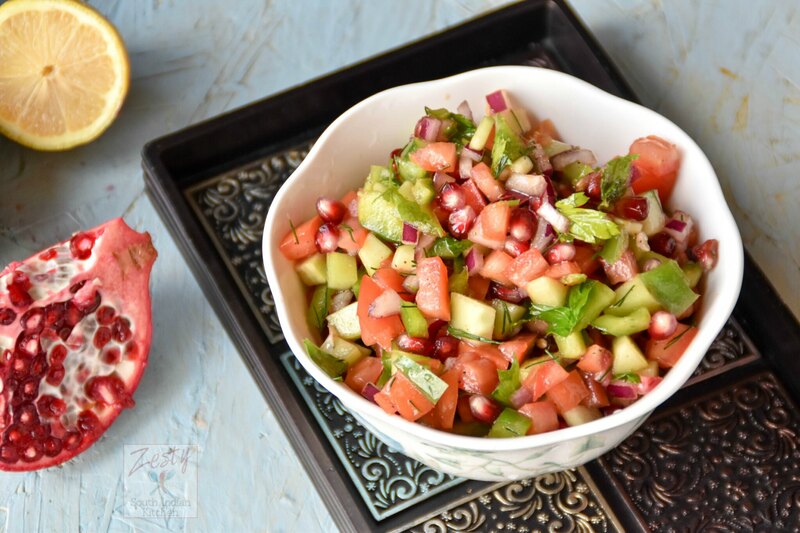 Yummy and delicious salad Swathi..
That’s one of my favourite classic Middle Eastern and Turkish style salads, So easy and so delicious! I did see this book at the book fair but it is so expensive… 🙁 This salad looks really good, I am definitely going to try this, pinning this!